Thousands of Bartlesville residents converged on downtown Bartlesville Thursday evening to celebrate Bartlesville High School homecoming, with a parade and tailgate rally, sponsored by Main Street Bartlesville. Event chairwoman Laurie McCoy said the organization was proud to have the two events combined for the first time to bring a huge celebration to downtown Bartlesville. “We were excited to have the Main Street Bartlesville Tailgate Rally and Bruin Homecoming Parade combined into one big event this year,” McCoy said. “The tailgate rally has grown each year and we know it would be bigger and better than ever this September with even more people coming downtown to show support for the Bruins and visit all of the great booths from local businesses and organizations.” The parade stepped off at 6 p.m. and marched through the streets of historic downtown. 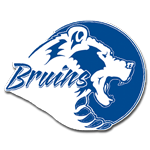 With the colors of blue and white, the community gathered together to support and cheer on the Bruins as they are scheduled to take on the Muskogee Roughers at 7 p.m. Friday night at Custer Stadium. More than 50 tailgate booths including local businesses, nonprofits, churches and school organizations set up along Frank Phillips Boulevard to show their support for the Bruins. The participants raised money for both Main Street Bartlesville and student clubs and teams. In addition to all the parade participants, the tailgate rally brought together football players from the YMCA youth programs through high school varsity, along with Bruin Brigade, cheer and pom squads for one big celebration. Beth Daniels just recently moved to Bartlesville from Texas. She was downtown Thursday with her three children. She said the event was one of the best she has seen. “The community spirit here is amazing,” Daniels said. “When I first moved to Bartlesville, I was really unsure about what type of things were going to be available. This is my first parade and rally, and I am really impressed. The city showed that it comes together to put on events to support the team. It was so much fun.” During the rally, the crowd swelled and cheered on the Bruins. Bartlesville varsity football coach John McGee even got up on the stage and showed off his dancing moves before crowd surfing with the football team.